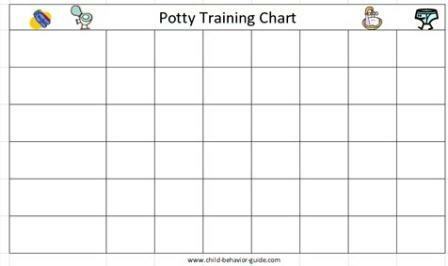 Download a free printable potty chart to help reward the necessary behaviors when teaching children. Using sticker charts are a great way to help children acquire the skills needed to start training and get excited about becoming a big kid. You may even consider starting your training experience by giving your child a certificate for big kids award. However, in addition to downloading these, the best way to train a child is by doing intense potty training in a day, 3 days consecutively or a week even depending on how much time you have. This can be done after a child is able to independently do the items listed in the chart below. 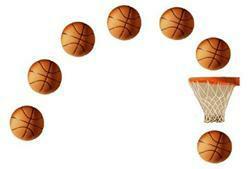 You don't want to train too early or your child may become discouraged by not being able to do many of the tasks. By eliminating distractions and using repetition with your child, you will find that he/she can focus on the task and learn much faster, which makes it easier on you both. 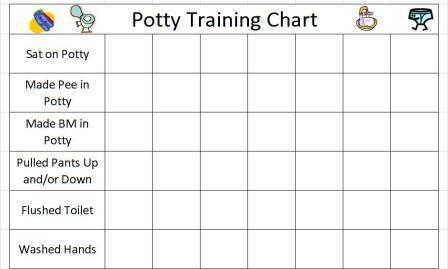 So, after choosing which potty training reward chart you would like to use, be sure to also check out the page with great ideas for potty training kids. Note: You will need Adobe Reader (the latest version is recommended) installed on your computer and pop up blockers disabled in order to open and print a kids chart. You can get Adobe Reader here (a new window will open so you can download it without leaving this page, but you will need to temporarily disable any pop up blockers to open the new window and the charts). 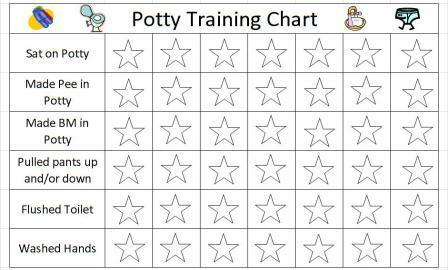 The second potty chart is more interactive by allowing a child to color the stars as he/she completes a behavior. This eliminates the need to use stickers if you would rather not have to worry about getting some. Be sure to praise children as much as possible for each behavior as well. This should be an exciting process for you both. Finally, the third chart is blank so that you can customize it to fit your own needs. It can be used to help avoid potty training accidents by giving a sticker for every 15-30 minutes your child stays dry. It may also be used to reward any attempts of initiating without any prompting by going to the toilet and trying to urinate or have a bowel movement.